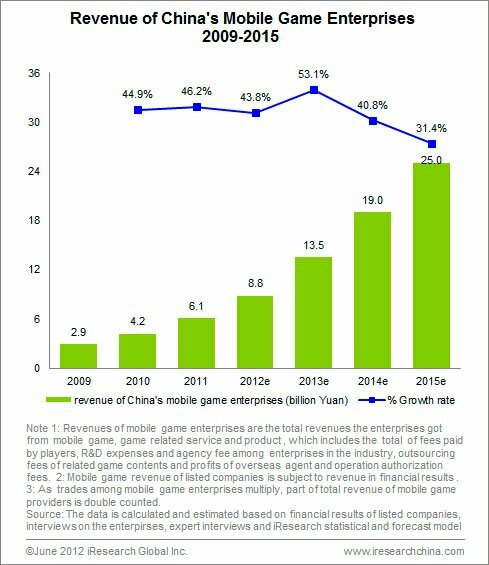 China’s mobile gaming industry has been booming ever since games started to be offered on smart devices (phones, tablets, etc.). It is believed that approximately 100 mobile games are released in the country each day. This trend has consumers converting to smartphones and leaving behind social and browser-based games on computers. As per Kevin Hause, senior partner of Niko Partners, “mobile games make up the fastest growing segment in the Chinese games market.” Thus far, there’s been a growing popularity of social mobile games, in addition to those that are casual/trivia role-playing and strategy based. Niko, an Asian Games Market Intelligence company, agrees that the mobile market in China is red hot; the reasons for it are in the Chinese Mobile Games Market Report 2013, which has become available on Sept. 4. This is an analysis that shows the expectation of the mobile gaming industry in China and reveals details on market size and forecasts. In the report is predicted a strong growth this year; this may be due to the availability of smartphones which helps promote mobile games in the country, and/or the migration of users to 3G and faster networks that provide reliable mobile Internet access. Niko’s assessment, after surveying 4,000+ gamers and collecting data on 370 million smartphones, presents the facts and figures that show the growth and trends in China’s vast games market. Findings support the observation that the mobile gaming market in China has been growing rapidly. In fact, it made known the Chinese gaming market is expecting to reach $1.3 billion by the end of 2013; this is up from $750 million in 2012. This is representing a compound annual growth rate (CAGR) of 46 percent from 2012 to 2017, according to Asian market-analysis firm Niko Partners. Since China’s mobile gaming revenue will likely get bigger in the region over the next few years thanks to strong sales of developed games, more developers are creating games for smartphones. This could lead to higher quality games to hit the market in the near future. As of today, “there are more than 80,000 development studios in China that are currently working on mobile games [and working to consolidate the market],” as mentioned in the report. As demand grows for smartphones, the mobile gaming industry will continue to show a strong growth rate in China and Asia, the world's largest and most populous continent, reported China Daily, which is China’s most influential English-language Web portal. It has several articles that convey consumers are engrossed in their mobile devices to play games. As a result, this has created huge business opportunities for Chinese developers to create games for mobile phone apps that can provide the same convenient entertainment from PC to mobile players to engage in games on-the-go, anywhere and at any time. Those that want to know more about Chinese mobile games and mobile devices can obtain this 36-page report on Niko’s website, which is available now for a hefty price ($4,000). The report gives a detailed analysis of the Chinese and Southeast Asian game markets. It helps one to understand how gaming materialized on the mobile side, as a result of being more convenient and flexible for users.